After "The Golden State" legalized recreational cannabis sales on Jan. 1, 2018, we uncovered three California marijuana stocks expected to deliver once-in-a-lifetime fortunes. You see, analysts project that California marijuana sales could reach $20.2 billion. Those who invest in the new "California gold rush" now will make the largest long-term profits. And once small pot stocks go from $1, to $10, to $20, or more… you may never see a chance like this again. But not every marijuana stock is a winner. In fact, there are hundreds of marijuana stocks that absolutely do not deserve your hard-earned money. Worst of all, there are even scams designed to make others rich while your shares plummet. That's why today, as a service to Money Morning readers, we had to provide all the details about the three biggest rules to know before buying California pot stocks. Here's how to profit from the $20.2 billion California cannabis industry while also practicing "safe" investing. This allows you profit from the massive industry without risking the majority of your investing capital. Penny stocks are known for their volatile price swings, like we saw on Jan. 4, when U.S. Attorney General Jeff Sessions ended an Obama-era DOJ cannabis policy. 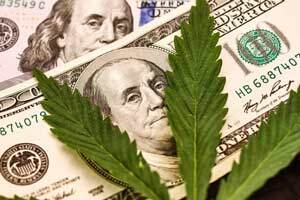 The price of GrowGeneration Corp. (OTCMKTS: GRWG) dropped 18.49% on Jan. 4. Cannabis Sativa Inc. (OTCMKTS: CBDS) fell even more, plummeting 19.30% during the same time. But if only 2% of your portfolio consists of penny pot stocks, you won't succumb to panic investing, buying high and selling low. On top of limiting how much you allocate to cannabis stocks, investors also need to avoid message boards and sites attempting pump-and-dump schemes…. Unfortunately, there are numerous pump-and-dump scams in the marijuana industry. Back in 2014, four individuals were accused of artificially inflating the price of six stocks – two being cannabis stocks – through manipulative trade tactics designed to increase transaction volume. The two cannabis stocks were GrowLife Inc. (OTCMKTS: PHOT) and Hemp Inc. (OTCMKTS: HEMP), and the duo made roughly $2.5 million in illicit profits. PHOT prices opened at $0.15 on Jan. 2, 2014, and climbed all the way to $0.78 per share by March 17, 2014. The HEMP stock price opened at $0.23 per share on Jan. 2, 2014, and skyrocketed 1,260% to $3.13 per share on Feb. 6, 2014. However, PHOT prices collapsed 85.89% to $0.11 per share by May 12, 2014. The HEMP stock price also fell to $0.26 per share by Oct. 8, 2014, a loss of 91.69% from its all-time-opening-high price of $3.13 in 2014. Two people involved with the scams were sentenced to jail. Investors who bought in at the peak lost almost all of their money. Here's how it works: When trading volume is increased and other investors see the activity, some investors buy shares of this "hot stock" without asking any questions. They may believe insiders know something they don't and fear they are missing out. When the demand sends prices higher, the pumper cashes out and everyone else is left holding a bad investment. Prices then plummet, because there is no one left to manipulate transaction volumes. So instead of looking for tips on shady message boards or websites that might be run by pump-and-dump groups, we advise our readers to sign up for our free Profit Alerts service. You'll receive real-time recommendations about marijuana stocks from our research writers and team of gurus, like Money Morning Director of Technology & Venture Capital Research Michael A. Robinson. Robinson's been a giant in tech investing for more than 30 years. As a leading analyst and tech journalist, he's been on the forefront of just about every major emerging technology story of the last decade. He's even been nominated for a Pulitzer Prize. And as a special service for our readers today, we're going to provide all the details on how to access a California marijuana report from our pot stock expert. He'll show you how to take the first step on the road to marijuana millions.